thank you Seiiryuu for the awesome GIFs! - do not hotlink!! 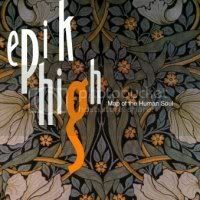 Epik High debuted in 2003 with Map of the Human Soul, featuring Korean hip hop legends such as CB Mass, Drunken Tiger, and T. Their follow-up albums have always featured other well-known artists such as Nell, Clazziquai, Loveholic, TBNY, unknownDJs, Pe2ny, and more. 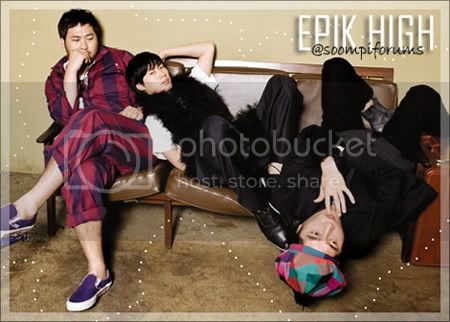 Epik High, especially Tablo, is often featured in other artists' music as well. 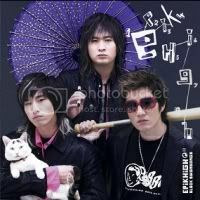 Due to the lack of popularity of hip-hop music in Korea in the early 2000s, Epik High was not very well-known in the beginning. Starting with hits such as "High School" and "Lesson 2 (Sunset)" of the second album, people began to pay more attention to the group. 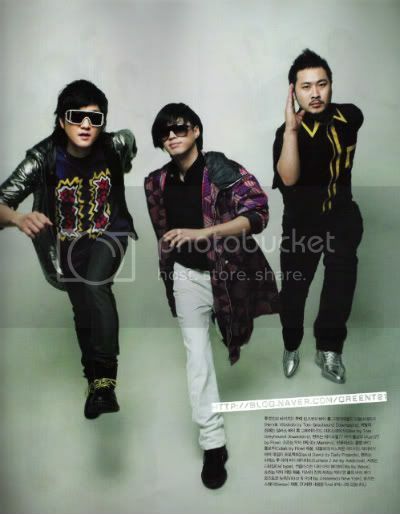 When the third album was released in 2005, they suddenly became one of the most popular hip-hop groups in Korea due to the title song "Fly" and the track "Paris" (which became number one on many programs and even was in a video game FIFA 07). The fourth album introduced a different type of sound, but fans adored it and "Fanatic" and "Love Love Love" became instantly popular in 2007. 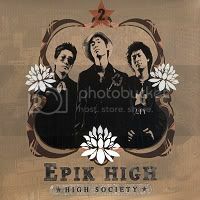 In 2009, Epik High left their label and created their own independent group under the name Map the Soul. Their seventh work was a book-album by the same name, and they went on a world tour to promote. 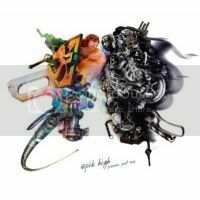 Although no longer attached to the money and support that major labels provide, Epik High still manages to produce top-notch music for themselves and for their fans. Producer, lyricist, MC, writer Real Name: Lee Sun Woong (이선웅) or Daniel Armand Lee Tablo (born July 22, 1980), is the leader and rapper of the group. He was born in South Korea and moved to Canada when he was eight years old. 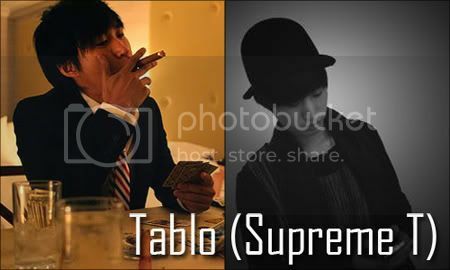 Tablo is known not only for his appearance in Korean variety shows and sitcoms such as MBC's Nonstop5, but also for his Bachelor's Degree and Master's Degree in English Literature and Creative Writing from Stanford University, California, USA. Tablo was a big hip-hop fan ever since he could remember, listening to old Run-DMC and Cold Crush tapes and always rhyming around the way in South Korea. But there was one emcee who inspired him to take it seriously. After he heard Drunken Tiger rapping, he became part of a group called Epik High in 2000 and also claimed to be the first emcee to invent the rhyming rifle. In the fickle world of hip-hop, Tablo kept his name alive over the years by doing shows and various cameos with the EPMD. He is planning on making his own album later. 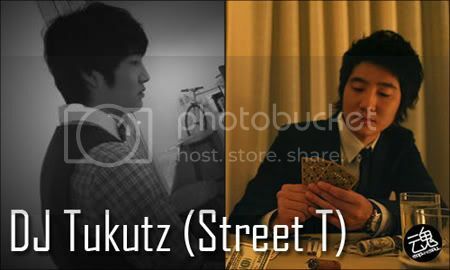 Producer, turntablist, engineer Real Name: Jeong Sik Kim (김정식) DJ Tukutz (born November 19, 1981), is the disc jockey for the group. DJ Tukutz first got into DJ-ing in the summer of 1995 while spending his time at illegal raves and warehouse parties, where his passion for the scene and music began. He started playing at local raves and parties in Japan's underground Hip-Hop scene, before moving up to South Korea in 2000 to attend the Technics DJ School. After returning from the academy, he hooked up with Tablo and headed to the states. He worked and DJ-ed on radio shows, live events and clubs around the Boston and New York City area. Producer, lyricist, MC Real Name: Choi Jin (최진) Mithra Jin (born January 6, 1983), is a rapper in the group. 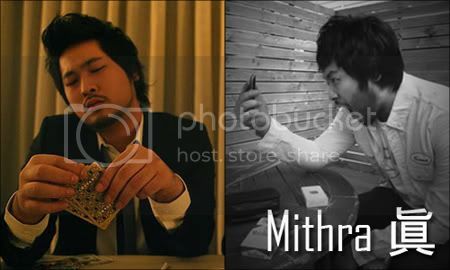 Mithra Jin was originally a poet whose poems also worked as rhymes. Park emceeing and poetry readings were the first places where he met his future partner Tablo. They were introduced by a mutual friend and clicked right away because each other's style of poetic rhymes was comparable. i'm up to track 6 on the 3rd album. i love it so far. i listened to paris and let it rain too...great songs. are they still considered underground?? epik jjang! the new album blows your socks off! 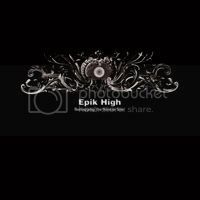 wow, epik high has it's own pinned forum! 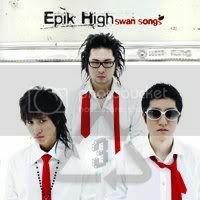 i just got into epik high recently after listening to a song they sang with Lyn. So why is epik high considered K-underground? What is so unique or different about their music? 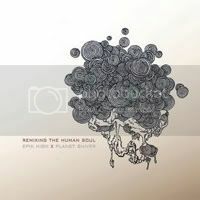 The new album is awesome. I'm totally hooked with "Let It Rain"
wow, they already have 3rd album. cant wait! Is the 3rd album officially out in the stores? 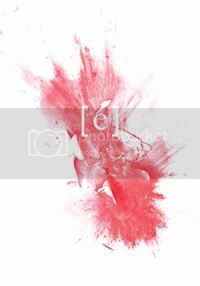 lyk so what is up with da swan sonG?..u brought dat up??? NONE OF YOU HAVE BOUGHT THE ALBUM AND MOST LIKELY ONLY A COUPLE WILL BUY IT LATER ON. I WOULD NOT ADVISE YOU TO REPEAT THAT ERROR. where can u dl it? 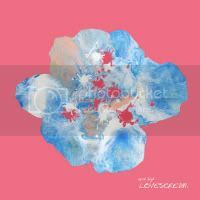 Along with "평화의 날" from their 2nd album. At the moment I only own "Map of the Human Soul." I love this album~~~ yay! Overall this album is a nice blend between 1st album and 2nd album. A little too much featuring (not saying their bad), and vocal. Tablo posted on his cyworld that this is not their last album (although title is swan songs), infact their gonna start something 'fresh' in their next album, which he didn't reveal.